Dhaka, Jan 2 (Just News): In the final year of her five-year tenure, Bangladesh Awami League president and prime minister Sheikh Hasina on Tuesday expanded her cabinet inducting three new faces into it and promoting a state minister to a full one. 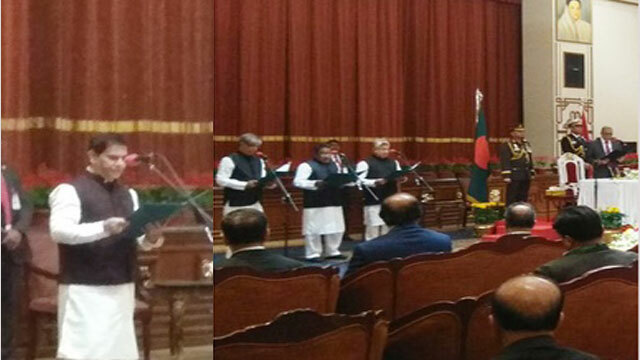 President Md Abdul Hamid administered the oath to three ministers - Narayan Chandra Chanda, AKM Shajahan Kamal, and Mustafa Jabbar - and one state minister - Kazi Keramat Ali - at Bangabhaban in the evening. Currently state minister for the fisheries and livestock ministry, Narayon Chandra has been made full minister as fell vacant with the death of minister Md Sayedul Haque. An IT expert Mustafa Jabbar has been made minister under technocrat quota. The current 10th parliament is scheduled to expire by the third week of January 2019 and a general election shall be held within 90 days preceding the expiration of parliament.